These warm and gooey little tarts have a crust made from arrowroot and coconut flour, butter, applesauce, and an egg, and they’re filled with a chopped pecan-date-maple syrup-chocolate chip mixture that will take your taste buds right to heaven. I’d make this pie because of its looks alone. Look at all those beautiful little chocolate chips studding the top! This soft and sweet filling is surrounded by an almond flour and coconut flour crust with grass-fed gelatin, ghee, and maple or coconut sugar. This beautiful and classic-looking pie has more of a custardy filling, made from blended pecans, coconut oil, coconut butter, and the lovely flavors of cinnamon, nutmeg, and vanilla. Dates keep it gooey and melt-in-your-mouth delicious. Perfect with added orange zest! This simple paleo pecan pie very closely resembles its sugary, grain-filled cousin, so it will please even the most particular of table guests. But it won’t put them into a sugar coma! Dates sweeten this filling, and the crust can be made with a flax egg to make it vegan. 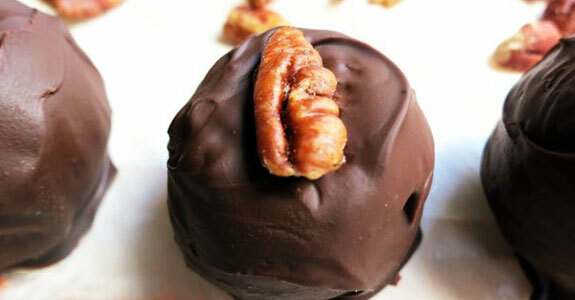 These truffles involve making sweet and gooey candy balls with dates, pecans, ghee, and maple syrup; freezing them solid; and then dipping them in silky melted chocolate (Enjoy Life chocolate chips are recommended, but you can use your favorite chocolate). I don’t know what it is about pecans and chocolate, but whatever it is, it’s truly amazing. 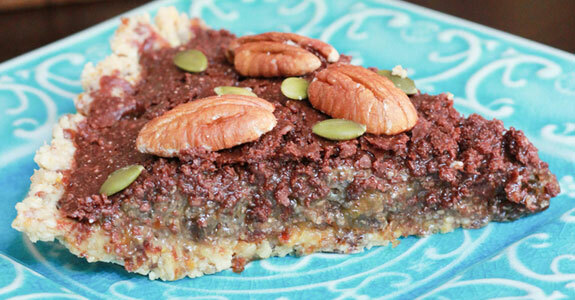 This paleo pie crust is filled with a coconut sugar, coconut oil, pecan, and chocolate chunk filling that’s crunchy, soft, gooey, and sweet—all the right textures and tastes for the best paleo chocolate pecan pie. 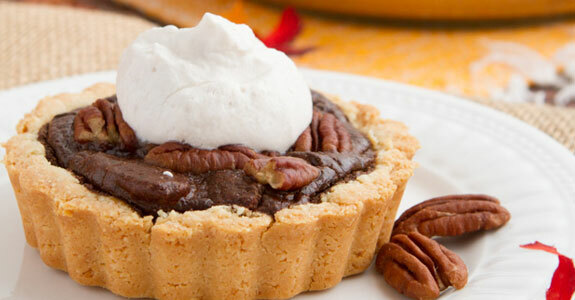 I had to include this fun variation on the traditional pecan pie. This frozen yogurt is made with homemade coconut milk yogurt, blackstrap molasses (unsulfured), pecan, grass-fed butter, cinnamon, and vanilla extract. It’s that simple, and it’s that delicious, too. 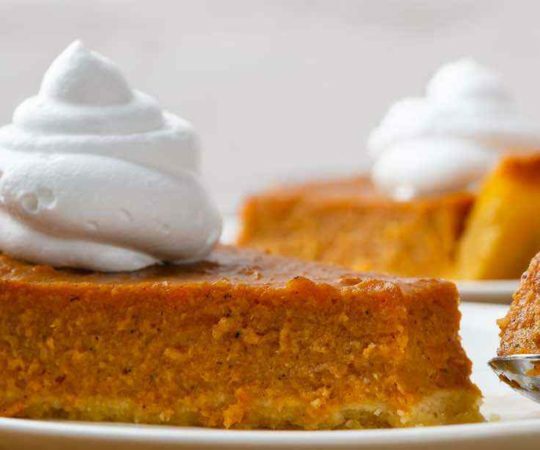 This little bites are great for when you’re craving pie but don’t want to go to the trouble of making the whole thing. They’re a bit of a cross between pumpkin pie and pecan pie, with a lovely date and pecan crust and a pumpkin-coconut-butter top layer. If you need a pie that doesn’t have any sugars, including maple syrup, honey, or coconut palm sugar, here is your recipe. The crust is made from blanched almonds, and the rich, chocolatey filling includes dark chocolate squares, coconut oil, and zucchini! This pie is sweetened with stevia. This isn’t a pecan pie in its true form, but with this awesome crust, how could I leave it off the list? For this recipe, you’ll need to replace the brown sugar with coconut sugar. 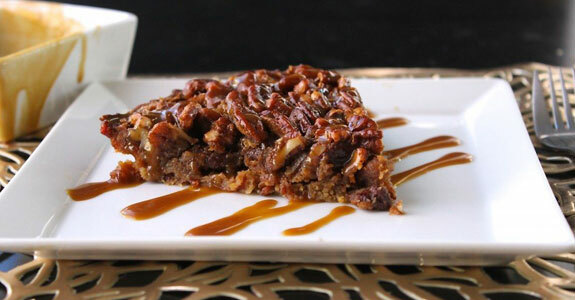 I think I could eat this salty pecan crust by itself right off of a spoon! Maybe you’re more of a tart person. If that’s you, then you better get to work on this recipe! Feel free to use coconut oil or grass-fed butter (or ghee) in place of the vegan butter or shortening (it’s a flexible recipe, friends—use the paleo ingredient of your choice). This is a homemade version of the popular store-bought food bar, Larabars. Larabars are easy to make at home as copycats, and with the pecan pie flavor being a favorite, this one is extra simple. Just almonds, pecans, and dates! That’s it. Maybe you’re more of a cookie person—or maybe you love pecan pie, but you need something a little more portable. Well, friends, here’s your recipe. 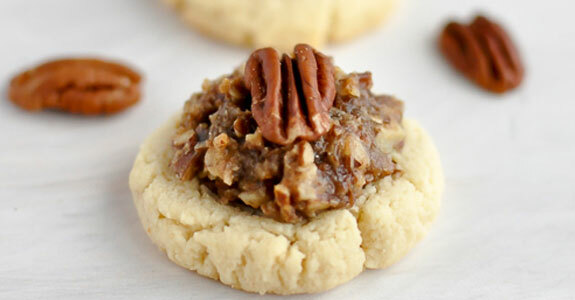 These cookies have a shortbread base with a sweet and maple-y pecan topping that tastes just like pie. These sweet little tarts look so gooey and melt-in-your-mouth good, and they’re so simple on the ingredient front! The crust is an almond flour, tapioca, and grass-fed butter crust filled up to the top with some fantastic butter-pecan-coconut milk business. This pie is another one for the books—or for the Thanksgiving table, where your family and friends won’t even realize they’re eating a paleo pie. This is an almond flour and coconut oil crust with a sweet pecan filling, thanks to plenty of coconut sugar and maple syrup. This super simple tart has a bit of espresso powder, which bumps the chocolate flavor up several notches and gives it an almost-mocha tune to sing to. 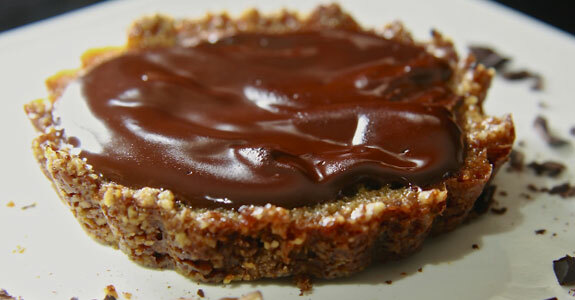 Almond flour and ghee keep this crust simple to let the chocolatey filling shine through. These tiny tarts have a pecan and butter crust, a buttery maple filling, and a luscious, silky, melted dark chocolate topping. They’re small, lightly sweetened, intensely flavored, and perfect for when you want something a bit more modest than a pie, but just as good. These bars don’t look paleo-compliant—but they totally are. Don’t they look bakery-delicious? This recipe uses a maple-sweetened almond crust with a pecan-chocolate-chip topping and a sweet, gooey caramel made from coconut cream, maple syrup, and coconut sugar. This is an extra sweet pie for friends and family with extra sweet teeth. A full cup of maple syrup gives it plenty of maple flavor and sweetness, while date paste adds a more caramel-style sweetness to things. 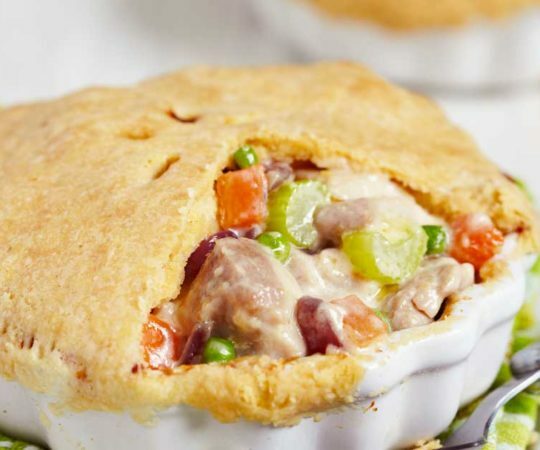 There’s a paleo pie crust recipe linked in this one. These sweet little squares can be made into three different types of desserts, each with a different style. 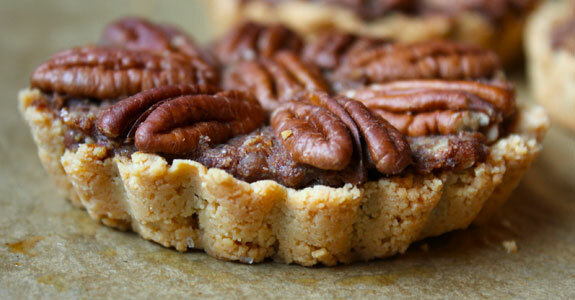 You can top them with pecans and keep them simple, you can put them in a tart crust, or (my favorite option) just drizzle them with dark chocolate. These paleo pie bars have a shortbread crust made with pecans, coconut flour, and arrowroot starch, and sweetened with a bit of maple syrup. The filling/topping is a salted caramel pecan goodness with coconut milk, coconut palm sugar, and coarse sea salt for bursts of flavor. 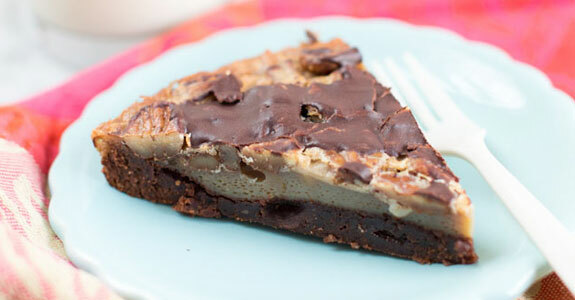 This pie brilliantly combines three different amazing pies into one. 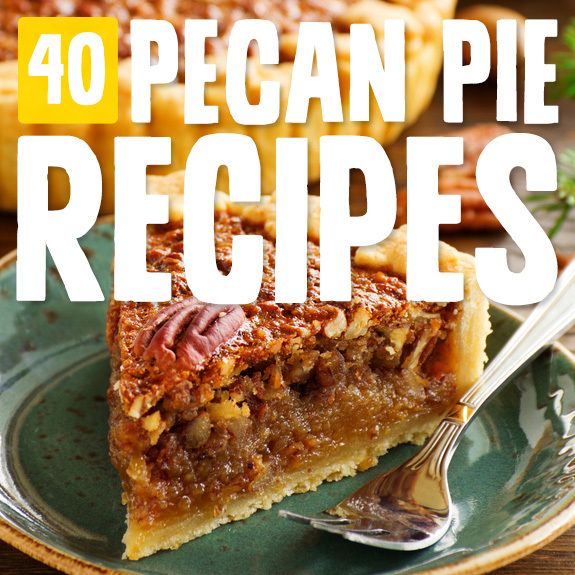 It has a spicy filling made with pumpkin, coconut milk, pecans, and warm spices, and a crust made from pecans and shredded coconut. 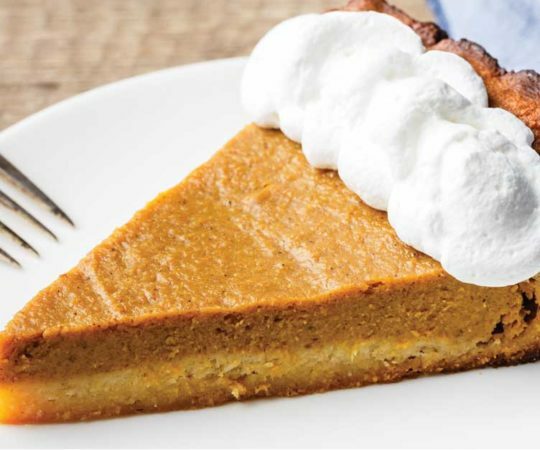 If you can’t decide whether you want a pumpkin, pecan, or coconut pie, pick this one. Here’s another combo pie for you to love. 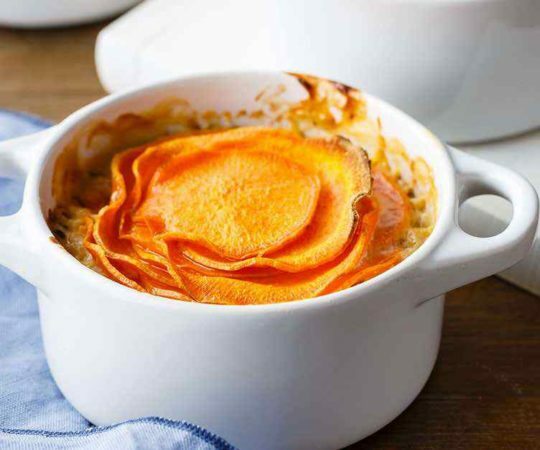 Sweet potatoes are the perfect base for this filling, which is packed with coconut milk and pecans, and sweetened with a banana and just a smidge of honey. Such a great idea! The sweet potatoes are plenty sweet already. 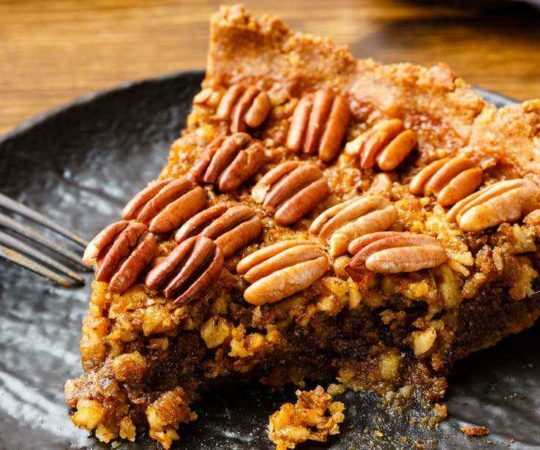 This pie has a lovely hazelnut and butter crust and a pecan-date filling with a classic flavor and texture. There are also a few pictures of cats included with this recipe, and let’s be honest: that’s half the reason why I’m sharing it. The other half is that it’s amazing. These itty bitty pies are perfect for pre-made servings, and they’re totally paleo. The crust is almond and flax meal, and the filling is made from dates (soaked), a ripe banana, coconut milk, cinnamon, pecans (duh), and a few other healthy and tasty buddies. Who needs crust? Nobody! These tiny mini-pies are bite-sized, as they’re made in a muffin tin, and they’re made with pecans, butter, coconut palm sugar, eggs, maple syrup, vanilla, and the secret ingredient you’ll have to see for yourself (hint: it’s bourbon). These are some of the simplest bars you’ll ever make. 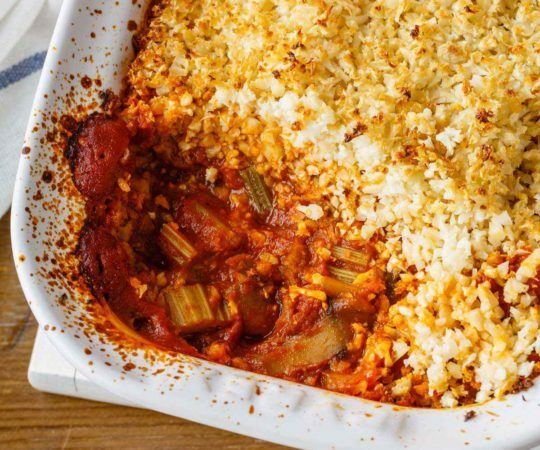 With only five ingredients in each part, you’ll make the crust in the food processor, bake it, and then food process the filling as well before dumping it over, packing it down, and baking again. Simple! This recipe is similar to the Larabars recipe, but also has apricots and blueberries for extra flavor, texture, and nutrients. Plenty of pecans and cocoa (or cacao) powder ensure a super chocolate flavor. And they’re healthy, too! I bet that’s a combination of words you never thought you’d read! But it’s true, friends. This pie’s crust is made from pasture-raised bacon and sweet potato flour, and it’s filled with a mixture of pecans, maple syrup, and coconut palm sugar stabilized with eggs. This recipe is a bit unconventional. The crust is made with pecan meal, coconut oil, and honey, but the filling is pure banana covered with a lovely and rich chocolate-coconut-milk ganache. Unique and delicious. 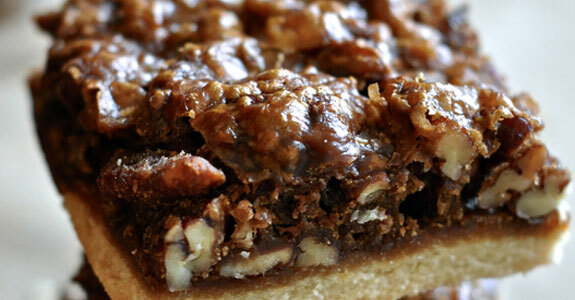 These bars would beat out regular pecan pie any day. I highly recommend using butter or ghee in the filling instead of coconut oil, simply for the amazing and luscious flavors grass-fed butter can add to this pie that coconut oil just can’t top. This pie pretty closely resembles the pecan pies of your past, so if that’s what you’re missing (or that’s what you’ve been assigned to bring to the Thanksgiving table), this would be an excellent recipe for you to try, with its almond-coconut flour crust and gooey filling. 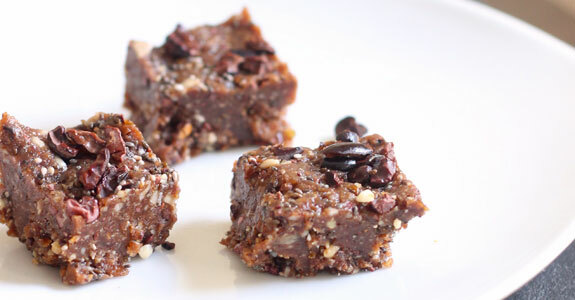 These bars are high in protein from the pecans and chia seeds, and optionally, you can boost them up with hemp seeds, maca powder, and vanilla extract. I’d add all three! You can also opt for either cacao nibs or cacao powder, depending on what flavor you’re going for. Just eight ingredients? Count me in! This super simple and easy pie is made with the usual suspects: pitted dates, maple syrup, coconut oil, eggs, coconut palm sugar, pecans, etc. But it keeps things very basic in its process and ingredients list, so you can make it up quickly. The flavors of this pie are made even more complex with the addition of sweet, thick, gooey apple butter into the filling. The apple flavors give this pie an extra air of fall that makes it perfect for Thanksgiving, but I’d enjoy it any time of the year. Sometimes, you just want a quick bite of pecan pie flavor, maybe a burst of energy, and that’s it. You don’t need a whole pie. For those days, this is your recipe. These little balls of joy are made with nuts and spices and taste like a pecan pie without the guilt and the sugar coma. This is all about the fudge. These bars have a deliciously fudgy crust of almond butter and cacao powder, and a filling of pecans, ghee, vanilla, honey, and eggs. They’re dense, chewy, and sweet, and can be topped with a lovely chocolate sauce. This recipe is a pecan pie-inspired coffee cake with coffee-soaked dates, almond meal, and a crumbly pecan topping that reminds me of pie. This cake does rise up a bit, so it’s not a fudgy texture like many pecan pie fillings—more of a fluffy coffee cake. Last but not least, I present you with these perfectly fudgy chocolate pecan bars, with a dark chocolate, gooey filling, coconut sugar, maple syrup, butter, and a lovely buttery almond crust that bakes down into a cookie beneath the fudgy chocolate filling.